Customize and purchase your door online today! The 24 gauge corrugated door curtain is manufactured from full hard galvanized grade 80 steel and coated with Super Durable polyester paint that is backed by a 40 year film integrity and a 25 year no-fade limited paint warranty. Independently tested, the Model 3400 meets the requirements of the Miami-Dade County Product Control Division for the high velocity hurricane zone (HVHZ) of the Florida Building Code. Design wind load is rated +43 PSF and -49 PSF. Available in sizes up to 12’0” x 18’0” and in white only. Up to 8'0" 8'1" to 9'0" 9'1" to 10'0" 10'1" to 12'0" 12'1" to 14'0" 14'1" to 16'0"
= Not Wind Code Certified. Tough, durable and wide, heavy duty nylon strapping helps control curtain stretch while deadening sound and reducing wear. The 11 gauge windlocks provide the strength to meet the stringent wind load requirements when engaged under load; however, easy operation is provided during load-free operation because the windlocks do not come in contact with guide. The flat door stop slide makes installation quicker. Simply slide through the holder on the guide and affix with a fastener. The 12” enclosed barrel houses the dead axle assembly and protects the factory lubricated springs from direct contact with environmental elements. The inherent strength provided by the spiral barrel minimizes axle deflection, providing smoother operation. Because the curtain is attached by screws and not seamed to the barrel, replacement of either independent assembly is cost-effective, quick and easy. A reduced drive chain hoist for smoother operation is standard on all door sizes. Magnetic Stainless Steel Latch - Our new patented mini latch features a cover plate made from a heavy gauge of stainless steel. In addition, the latch cover protects the slide from tampering by completely covering the slide with the exception of a tab used to operate the latch. To further secure the door, the latch's two-inch throw with its magnetic properties can be incorporated with the new guide-mounted security devices. This versatile design affords the ability for you to utilize padlocks, cylinder licks or both. Top Draft Stop - 2 1/4" Black "L" shaped neoprene weather stripping affixes directly to the door curtain where the curtain meets the header and provides a barrier to weather elements. Rolls up in the roll when the door is in the up position. Hood - Recommended for exterior mount applications or for cosmetic appearance. If the door is being mounted on the outside of the building (where the drum is exposed to the weather elements) they will need a hood (or protective over-hang) because the drum of the door is not weather-proof and could be damaged by rain, snow, etc. 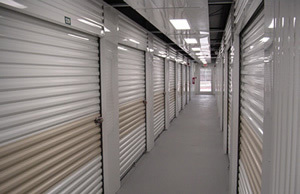 Insulated doors can NOT be mounted on the outside of the building or have a reverse curtain. Side Brush Seal - 2” Polypropylene Side Brush Seal with Aluminum Retainer mounts on the side your frame work. The flexibility of the brush allows complete seal of the roll up door corrugation. Keeping out dust, air flow, pesky insect and rodents. 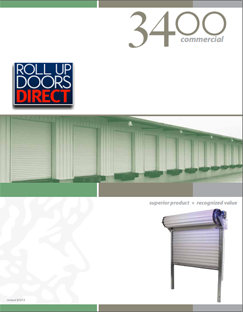 The Pantheon range of low voltage DC operators are designed to fit enclosed internally in the barrel of the rolling door, providing quiet and efficient operation but requiring only minimal side room. The logic controller is designed to be readily compatible with external transmitters, receivers, photo eyes and sensing edges. The operator is always fitted to the right side. Insulation is made of a foil-backed, dual-layer polyethylene air-bubble insulation secured in place with a strong adhesive and joined by mylar film to provide an R value of 4 (top draft stop and side draft stops are also included). Model 1000I only. Vision panels provide outside visibility and allow light entry through the 5” x 17” panel. Constructed of a translucent polycarbonate panel inside a glossy white 20 gauge frame, the panels create no interference with the operation of the door. The location and number of vision panels are limited by the door size. Ask a sales representative for details. Universal mount 4” deep 11 gauge galvanized steel wind bar guides require no Pre-installation modifications for steel, concrete or filled masonry block applications.